The Apna is a small shop-type premises at the heart of an area with large South Asian populations, in the centre of Haslingden. 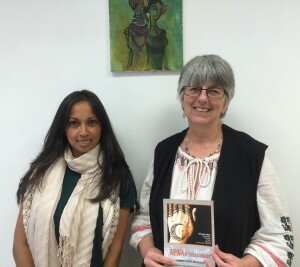 The project is being led by a member of the community, Arry Nessa, who has strong local connections and experience in community activities, supported by an active team of local South Asian women. The Apna works mainly with South Asian women who are isolated and who often do not access services available to the wider community. There is also a lack of educational opportunities and culturally suitable spaces to visit. Haslingden has several language groups within the South Asian community and there is an increasing demand from women of different backgrounds to meet together. 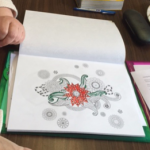 One unique feature of the Apna is that alongside having a broad educational, community and well-being brief, these three elements are united around an arts and a cultural perspective. This works in several ways, cutting across many barriers that can otherwise separate and divide communities. It also looks outwards, acting as a exponent and showcase of contemporary Islamic art and culture to the wider community. 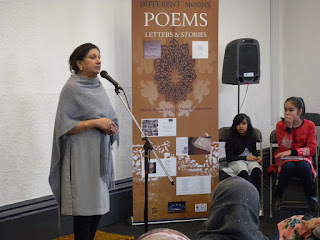 During the brief three-month pilot period, for example, it held well-attended exhibitions by young local South Asian painters, the London-based artist Rahima Begum, participated in the Rossendale Open Studio Arts Trail, and showed calligraphy from the Liverpool Arabic Calligraphy Association, featuring work by the Omani calligrapher Hst Al-Awaidi. A significant benefit to providing a space in the town centre is that it welcomes women to a central meeting place where we can include women from across communities – a valuable asset in making and strengthening links and community health and well-being. The pilot project ran between August and early November 2015. This exceeded all expectations, running 63 workshops and attracting over 1000 participants and we are building on this clear demand. 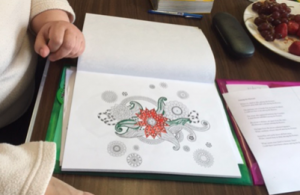 The next phase will be to develop a safe community space (the Apna) in Haslingden over two years, primarily supporting local South Asian women and young people through a range of cultural, well-being, health and creativity focused activities. This begins in April 2016 and will continue until March 2018. The space supports and encourages the most disenfranchised women and their families. 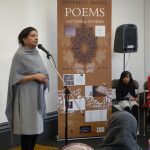 Haslingden has predominantly conservative South Asian communities, and despite many of them having benefitted from the Different Moons Project, the Apna has been successful in engaging an even wider circle of women. Although the focus will be on providing opportunities for South Asian women, the Apna centre will offer occasional sessions for men. We will also begin a programme encouraging young people to participate in workshop groups.